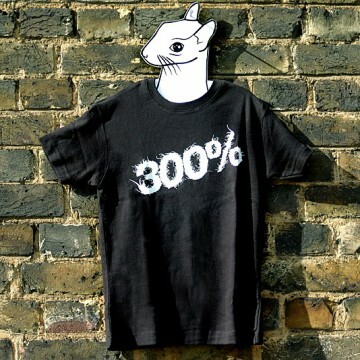 The 300% T-shirt was created as part of a collaboration between Stereohype, Laurence King Publishing and design studio FL@33. 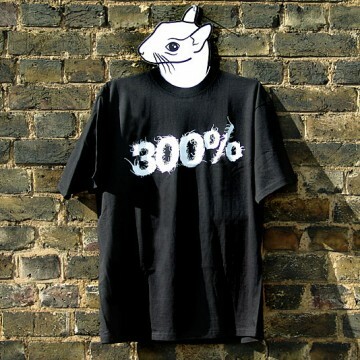 Available as a slim-fit T-shirt for women and a classic unisex T-shirt – the artwork 300% is also featured on the front cover of the book 300% Cotton – More T-Shirt Graphics, written by Helen Walters, published by Laurence King and designed by FL@33. This is the sequel of the hugely popular also FL@33-designed 200% Cotton – New T-Shirt Graphics and the 200% Cotton Dogs T-shirts. Both books also featured FL@33 and Stereohype T-shirts.